And all through the house the creatures were stirring! 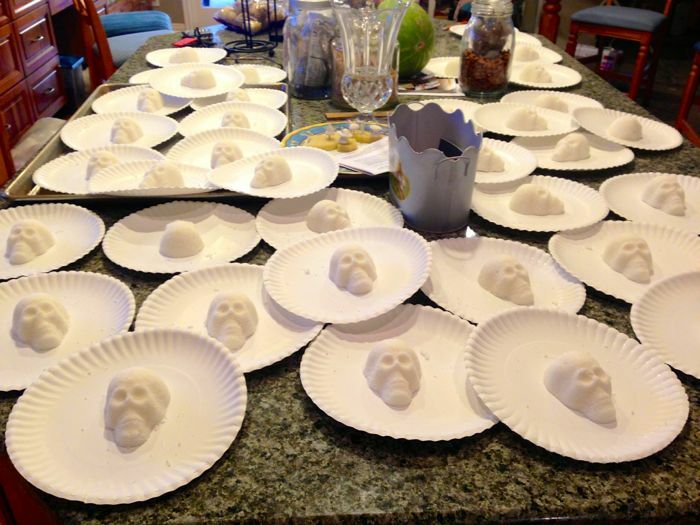 We have 45 sugar skulls. We have new seat covers. We have a baldric, a scabbard, and sword, a May Chang dress, britches, and a waistcoat. We have... a lot more to do before Halloween! It's kind of scary, actually. As for celebrating Dia De Los Muertos, which I feebly tried to rationalize... I offer this amusing example of how impossible it is to satisfy everyone's holiday-religious-non-denomenational sensibilities: From The New Yorker, "Dear Mountain Room Parents." As for us, I say cheers for the foolhardy, the creative types, the makers and DIY diehards! It's all hands on deck and full STEAM ahead, with joyous abandon! We shall prevail. Thank you for the laughs in that New Yorker piece! Very cool skulls! That New Yorker article was hilarious; thanks for sharing.